Practice writing a friendly letter with, a date, salutation, body, and closing. Write fan mail to your favorite author. Includes sample template and detailed instructions. Write a letter to your mom and tell her why you love her. This printable includes special stationery for a letter and picture. Write a letter to your father in which you tell him why he's special to you. Be sure the letter has a date, greeting, body, closing, and signature. 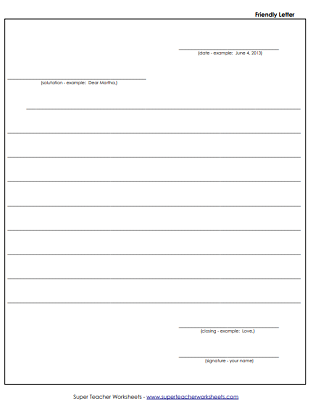 This worksheet includes clear directions and a template. Cut out the names of the parts of a friendly letter. Glue them into the correct boxes on the page. This worksheet includes a sample thank you letter. It asks students to identify parts of a thank you note, observe specific punctuation marks, and write several different closings. Write a thank you letter. Use the sample friendly letter as your guide. Rewrite the addresses. Use correct capitalization and punctuation. Rewrite the sentences. Be sure to include a comma and correct capitalization for each place name. Write each date correctly. Include correct capitalization and punctuation for each. 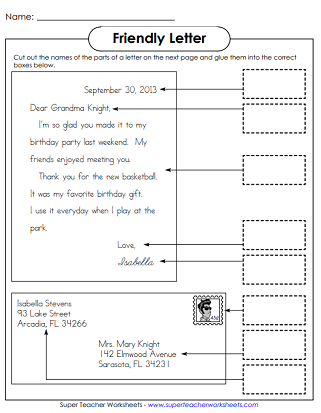 This template includes small-letter labels for each part of the letter, including date, salutation, body, and closing. Students write their friendly letter on the lines. This template includes small-letter labels for each part of the letter, including date, salutation, body, and closing. This version also includes examples for each. Students simply write their letter on the lines given. This template includes lines, but no prompts. This template includes a picture of Santa and a Christmas elf. See more of our writing worksheets. Kids love these color and write activities. Write creative stories that tell what's happening in the pictures shown. View our complete collection of reading and writing worksheets, including grammar, phonics, handwriting, and reading comprehension passages. Students express their personal opinions by writing persuasive essays on various topics.